Wednesday December 12, 2018-A section of youths in Nyamira County have praised embattled Migori Governor, Okoth Obado, for agreeing to turn over a new leaf and accepting Jesus as his personal saviour. 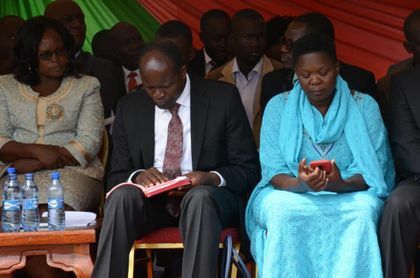 This is after a photo of Obado reading a Bible surfaced online; a clear indication that he is changed man even after committing atrocities like the murder of his lover, Sharon Otieno, and looting over Sh2 billion meant to help the poor residents of Migori County. The youths praised Governor Obado for accepting God after his tribulations over the murder of Rongo University student Sharon Otieno a few months ago. “Our leaders should copy what Obado is doing currently after he was released on bond following the murder charges he is facing in court," wrote Evans Nyangaresi. On his part, Amos Momanyi argued that Obado is seeking refuge in the church following the embarrassment he faced during his arrest. “He is reading the Bible to comfort himself so that he can continue serving the people of Migori," said Momanyi.